(Nanowerk News) Kansas State University scientists helped discover new details about an intricate process in cells. Their finding may advance treatments for cancer and neurological diseases. Kansas State University researchers Jeroen Roelofs, assistant professor, and Chingakham Ranjit Singh, research assistant professor -- both in the Division of Biology -- led part of the study. Both also are research affiliates with the university's Johnson Cancer Research Center. They worked with colleagues at Harvard Medical School, the University of California-San Francisco and the University of Kansas. The scientific journal Nature recently published the team's observations, titled "Reconfiguration of the proteasome during chaperone-mediated assembly". A computer model of the regulatory particle and core particle docking process that is controlled by chaperones. The research focused on proteasomes, protein complexes inside the cells of humans and other organisms that help keep the cells healthy. "The proteasome is a large, molecular machine in the cell that degrades other proteins," Roelofs said. "It's important for protein quality control as well as for the cell's ability quickly remove specific proteins, thereby ensuring the cell's health and proper function." The goal was to better understand how the various particles inside proteasomes work together to make the proteasomes function -- think the gears and components needed, and in what order, to build a working machine. Scientists believe that disruption of two key particles -- and consequently a proteasome's ability to work correctly -- has implications for cancers as well as various neurological degenerative diseases, such as Parkinson's and Huntington's diseases. The Nature study built on research that Roelofs made as a postdoctoral research fellow at Harvard Medical School in 2009. 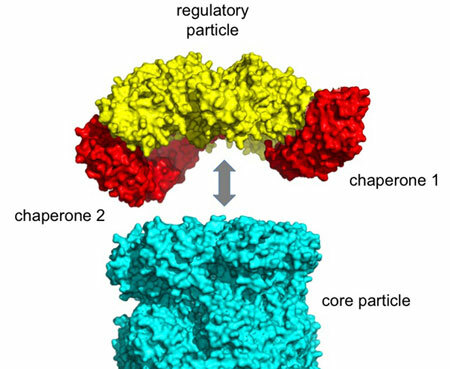 He found that proteins called chaperones play a key role in the assembly process of two particles that when connected, gives proteasomes the ability to scrub unwanted proteins from cells. Chaperones act as a foreman for the two particles. One of the findings in the new study is that in addition to acting as a molecular foreman for the two particles, chaperones also control when those two particles come together. Similarly, the scientists found more about the two particles. The core particle has seven pockets while the regulatory particle has six tails that tuck into those pockets. When docked together, they turn on the proteasome's functionality. "In the assembly process there is only one tail that actually determines how the core particle and regulatory particle bind together," Roelofs said. "That's surprising because there are six tails, but only one is needed to give specificity, and the docking into the pocket is controlled by the chaperone." Roelofs believes that the findings may reveal new targets for anticancer drugs, as a chaperone in the human genes is involved in liver cancer. The proteasome inhibitor Bortezomib is used in the treatment of current cancers. Additionally, the information may advance cancer and neurological research by giving scientists new pathways to study and manipulate. "This is pretty basic research," Roelofs said. "Understanding the basic mechanics can often lead to new pathways for improvement, which is essential when it comes to human health." Scientists made the findings through a combination of techniques, including Cryo-electron microscopy, X-ray crystallography, yeast genetics, biochemical reconstitution assays and proteasome activity measurements. These techniques helped researchers observe the submicroscopic tails and complex tail-to-pocket binding process, as well as study the role of the chaperones in the core and regulatory particle process.